Learn about how NIS was first developed. Nutritionally improving straw by dipping straw into vats of lye (concentrated sodium hydroxide) was first shown to be effective in 1900. Straw was dipped in the solution until it was estimated that the chemical process had advanced enough. It was then taken out and washed with water. This was a very difficult process to manage – the product was inconsistent, the process was dangerous and produced a lot of effluent. Not surprisingly the product was not a success! However, a successful commercial process was patented in 1972 and the product was first produced in 1976 – at our mill! The product was very successful and over a million tonnes had been produced by 1985. 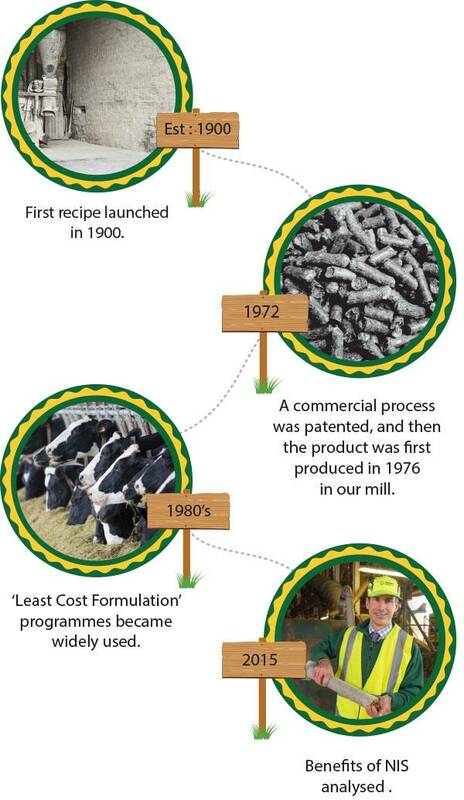 The introduction of milk quotas in 1984 reduced demand for all purchased feeds dramatically. ‘Least Cost Formulation’ programmes became widely used. These programmes are very effective at calculating the cheapest blend of ingredients to achieve a specified of energy, protein and fibre measured in NDF however they found it difficult to predict (or value) rumen function. The main benefit of including NIS in the diet is the improvement in rumen function which obtains more value from the rest of the ingredients. In a much reduced market place, without a clear ‘buy’ signal from a computer, the use of NIS dropped dramatically. A few farmers have continued to feed NIS as they had experienced the beneficial effect that it can have. Now, with a renewed interest in managing margins more effectively and more advanced knowledge about the importance of effective fibre, NIS is staging a comeback!